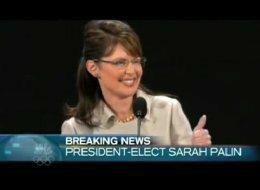 “Saturday Night Live” combined Sarah Palin and the disaster movie “2012” last night to imagine a world in which Palin had won the presidency. They used footage from the ’08 race and Palin’s recent publicity blitz along with the trailer for the John Cusack post-apocalyptic action film to create a harrowing end-times scenario in which Glenn Beck is one step away from the presidency. That was indeed funny but oh my, the thought of those two makes you sick to your stomach. Eww. Yep, Teaks right, I’m losing my groceries as we speak, especially considering Palins latest visit with the Billy Graham family. Looks to me like Caribou Barbie is using Billy’s son, Franklin, as her hot line to God. Pretty disgusting considering that Billy was sitting at Pappa Bush’s side when the bombing began for Operation Desert Storm. Also in his office was Bill Gates, while Bu$h was being updated by Cheney on the phone. Can you imagine Palin & Beck in control of this country? That would be like Bush in a skirt and Cheney with tears running down his face!